Reclaimer rhodes grass is a new release from Selected Seeds salt tolerant program and has shown increases of up to 20% DM production in trials compared to Katambora. Reclaimer is early maturing, erect, warm season, highly stoloniferous perennial Rhodes grass that has retained the attributes of Finecut but with increased stolon density and number of growing points giving increased plant recruitment that will form a dense mat over the ground more rapidly than other varieties. 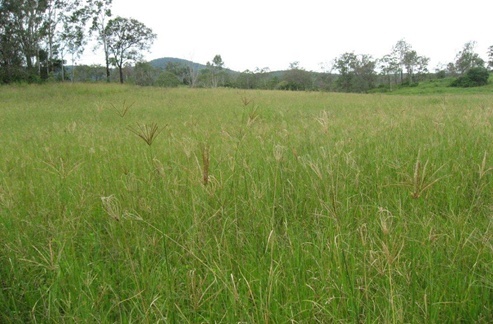 Because of its strong creeping habit Reclaimer binds the soils, providing good erosion control. In addition Reclaimer has increased dry matter production, (up to 20% over Katambora), with early uniform flowering, and dense growth once established. Bred for increased production in saline areas. Trials have indicated that established Reclaimer Rhodes will remain productive in saline conditions of between 4 to 10 deci Siemens, (dS/m), per meter and could survive in conditions up to 20 dS/m. 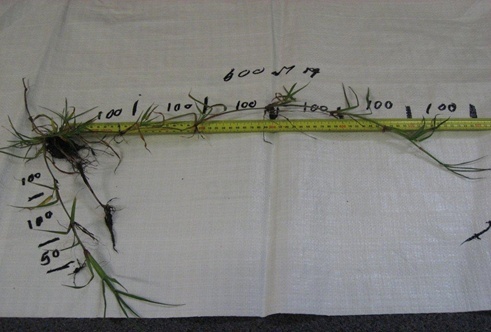 As an establishing plant Reclaimer may struggle to establish where sown into areas that are affected with surface salt. Reclaimer was selected from within the Finecut collection, from plants that had earlier demonstrated some saline tolerance and were put through a comprehensive salinity screening program. Reclaimer demonstrated higher tolerance to salinity than other selections tested through the “flood and drain” hydroponic system used. (depth <2cm). The seedbed should be fine and firm where possible. The seed will sit in the soil until sufficient rainfall for germination and the seeds with a level of dormancy may continue to germinate over the following 6 months. Like most sub tropical grasses Reclaimer is best sown in the early spring period or when soil temperatures are above 18° Celsius and rising. Recommended sowing rates: Reclaimer Rhodes can be sown in mixtures where it will complement the more upright varieties. Where it is sown into saline areas it is best sown as a monoculture. It is recommended to use coated seed to improve the ease of sowing and enhance seed placement. Coated seed should be sown at 6 kgs/ha as a monoculture with other salt tolerant legumes added at a later date.